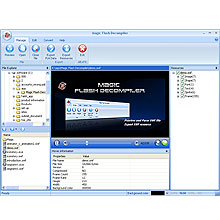 Magic Flash Decompiler 5.2.1.2 - Download Win Apps. Meet all your needs for decompiling and editing Flash. MFD is professional SWF decompiling software which offers a treasure trove of tools for those who want to extract elements from flash movies, edit dynamic texts and images of flash movies. You can effortlessly convert between EXE and SWF files. Video Decompiler - Extract Single Video Frames to Image Files. Video Decompiler and Extractor includes a powerful, fast, and easy to use video decompiler feature that can extract frames from video files and save to image files with ease.